Budget cuts in Oxfordshire could mean half of the county's street lights being turned off and several recycling centres being scrapped. Charges for park-and-ride schemes might also be reintroduced, fewer potholes fixed and funding for arts groups cut. The county council announced the plans two weeks after saying funding for nearly half its libraries and many of its youth services may be axed. The Conservative-run council needs to save up to £203m in the period to 2015. However, it said some areas would be protected - including the fire service, children's social care and winter gritting and snow ploughing of roads. One of the hardest-hit areas could be the arts, with proposals to withdraw funding to some of the county's theatres and the Oxford Literary Festival. Half of Oxfordshire's street lights could be switched off overnight. Three of the county's eight waste recycling centres may also close. The council believes £1.6m could be raised by reintroducing charging to park in Oxford on weekday evenings and Sundays, as well as charging to use the park-and-ride. Two weeks ago, the council announced plans to withdraw funding for 20 of the county council's 43 libraries, and 20 out of 33 youth services. It said it hoped volunteers would step in to run the services under Prime Minister David Cameron's Big Society plans. A proposed 1,000 job losses before 2015 across the whole council have also already been announced. 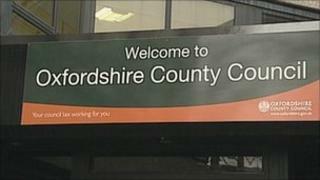 Councillors are still waiting to find out how much the county's budget will be from the government. They say they are already on course to save £35m this year from staff cuts, a pay freeze, management restructuring and cutting costs. Some readjustments to all the proposed cuts might have to be made but a final decision is expected in February.